Rome is a beautiful and vibrant city that everyone should visit at least once, although few who do so will not make a second, third or fourth visit. Of course, however often one stays in a place, the experience can be a memorable one when it involves a luxury hotel stay, not least those where a spa is involved too. 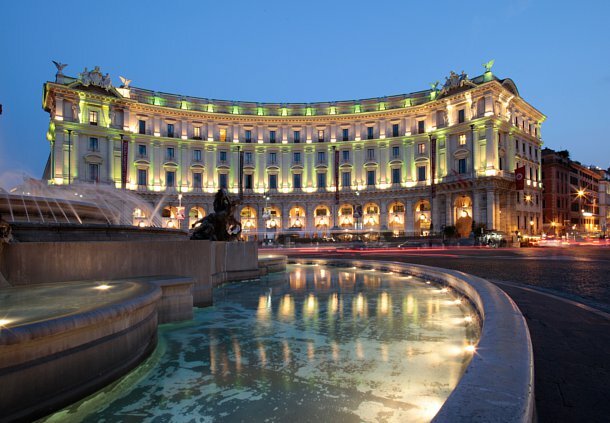 For that reason, there could scarcely be a better place to stay in the Eternal City than the Boscolo Exedra Roma. Its location is superb, being situated in Piazza della Repubblica and fitting snugly between the Baths of Diocletian and the Basilica of Santa Maria degli Angeli, which was designed by Michelangelo. The hotel is truly worthy of such a setting, its curving, palatial white frontage testifying to the majesty of this, the first five-star hotel in Rome. With 238 rooms, two fine restaurants serving superb food, a magnificent terrace with unsurpassed views and a modern business centre suspended above historic Roman ruins, this is a place to behold. However, that is barely the half of it. Great architecture, fine food and large, stylish rooms are all great things, but the Spa and Wellness Centre is simply in a different class. Offering relaxing and energising courses to refresh the most stressed of people, the spa has beautiful surroundings, top-quality facilities and a dedicated, skilled team on hand to provide a fabulous experience. There are some excellent spa packages available. For example, the package for two people includes a stay in a double room with a buffet breakfast every morning, complete with a Wellness couverture in the room on the day of arrival, consisting of flower petals and bath salts. Also included is a day at the spa with a full treatment course, complimentary entry to the fitness centre, and the options of an upgrade to a higher category room, plus early check-in and late check-out, subject to availability. This is just one of many spa packages available, so visitors can choose the one that suits them. Whatever the package is, you can be sure it will provide relaxation and top-quality treatment amid some amazing luxury in the heart of a stunning city.